Sometimes the characteristics whose possible correlation is being investigated, cannot be measured but individuals can only be ranked on the basis of the characteristics to be measured. We then have two sets of ranks available for working out the correlation coefficient. Sometimes the data on one variable may be in the form of ranks while the data on the other variable are in the form of measurements which can be converted into ranks. Thus, when both the underlying variables are ordinal or when the data are available in the ordinal form irrespective of the type of variable, we use the rank correlation coefficient to find out the extent of relationship between the two variables. This rank correlation coefficient is also known as Spearman's rank correlation coefficient. Rank correlation is a non-parametric technique for measuring strength of relationship between paired observations of two variables when the data are in a ranked form. 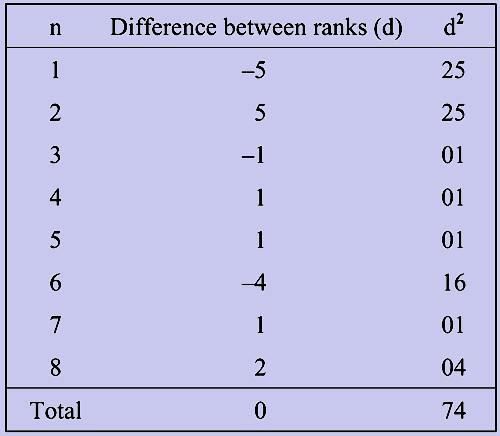 Rank Correlation measures the degree of agreement between the two sets of ranks. The ranks of 8 students are given according to their marks in English and History. The correlation between the ranks is seen to be low.